A round cut diamond lies neatly in the center of each of these diamond flower dangle earrings from Apples of Gold Jewelry. The diamonds, which have a carat weight of 0.03 carats per earring, have a combined total carat weight of 0.06 carats for the pair, and are rated G-H for color quality and SI for clarity. 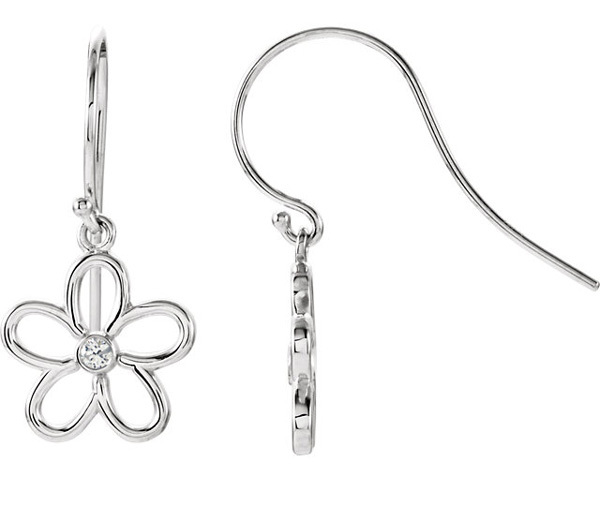 The diamonds, which are sure to glitter whenever they move, are set in a .925 sterling silver flower earring, each of which has 5 petals and comes complete with a fish hook wire back. We guarantee our Diamond Flower Earrings, Sterling Silver to be high quality, authentic jewelry, as described above.